Part Exchange Available! We are delighted to offer for sale this sophisticated and ''ritzy'' two bedroom, fifth floor apartment, within the 'Monument' development. It holds an enviable position and benefits from tremendous views of the surrounding area. This property was meticulously designed and constructed around 2004, to create a spacious, low maintenance, design-led property, that oozes modern contemporary living ! The apartment has been well designed to maximise the natural available light, creating a modern ambience. Room dimensions are incredibly generous and the accommodation has been arranged to offer flexibility and individuality, with a seductively elegant open-plan living, dining and kitchen area, which you can really roam around in. In more detail the property comprises: Welcoming entrance hall, with a useful walk-in storage cupboard. The open plan kitchen and lounge is a fusion of practicality and style. Striking worktops provide a fashionable and efficient workspace, set off perfectly by the kitchen units with chrome handles. A stainless steel oven, four-ring gas hob and cooker hood, means this kitchen is equipped for both convenience and functionality. There is the added advantage of space for a washer/dryer and an upright fridge/freezer. The lounge is a perfect area for relaxing or entertaining and there is room for a table and chairs for more formal dining with friends and family. The open plan style of this zone ensures the chef is never far away from the party ! 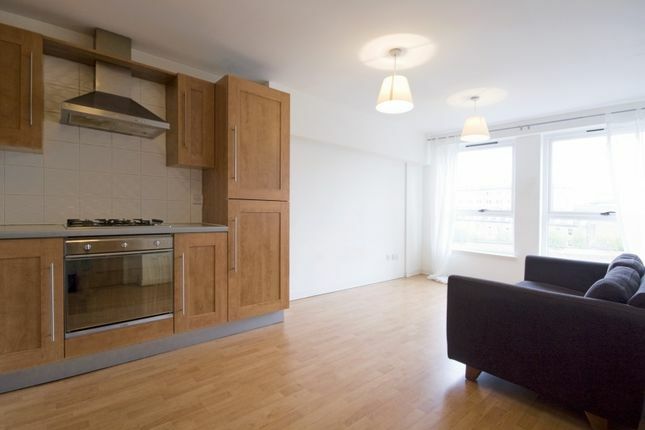 There are two, good-sized, double bedrooms, with ample floor space for additional freestanding furniture if required. The master bedroom features a range of fitted wardrobes and its own en-suite shower room. The second bedroom (with storage cupboard) could be used as anything you want it to be – a hot office space, studio or permanent second bedroom ! The contemporary, three-piece bathroom (partlytiled) provides the perfect ambience in which to unwind. The property further benefits from gas central heating to radiators and double glazing for additional comfort. There is also a lift and a security controlled door entry system for additional peace of mind. Externally, there are well-maintained communal grounds.